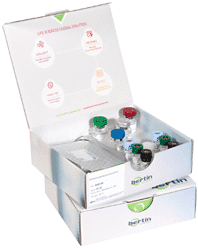 Bertin Bioreagent is a leader in biomarker assay kit development, production and distribution for life sciences lab thanks to 30 years of expertise. Biomarkers are powerful tools for drug development and for the discovery of new active compounds in cosmetics, food and agro industries ; even behavioral monitoring like in sport or food diet studies. Toxicity and efficiency of new molecules and drugs can be determined by studying biomarkers. Any biomarker deserves to have its best-in-class analytical tool which should be robust, ready to use, worldwide available and approved by the scientific community. Bertin Bioreagent offers more than 40 references of assay kits (ELISA, EIA, enzymatic…) and 240 references of antibodies (monoclonal and polyclonal) targeting biomarkers involved in various fields such as obesity, diabetes, pain, inflammation or endocrinology. Bertin can also develop custom made assay kits to find specific targets. The product range also includes necessary pre-analytical tools and biochemicals to collect and pre-treat samples for future analysis. All-in-one qPCR kit for simultaneous detection of B. anthracis, Y. pestis and F. tularensis. To grow, living organisms get their energy from the environment. For mammalians and higher organisms, this is under glands control, which may dysfunction and trigger metabolic diseases like diabetes, obesity and hypertension.